Have you noticed the constant feeling of Autumn around you when you’re shopping? Designers are going back to the basics and basing their designs off nature, not only in color but also in shape. Colors are remaining neutral and deeper while shapes are mimicking plants and waves, giving designs a more organic feel without being overly obvious. Porcelanosa has joined forces with its eight companies bringing out nature inspired products across the board. Starting off subtly, natural stone Kathmandu is a slate tile with uneven texture and color variation, resulting in a truly natural looking and feeling tile that can be used on both the wall and floor. 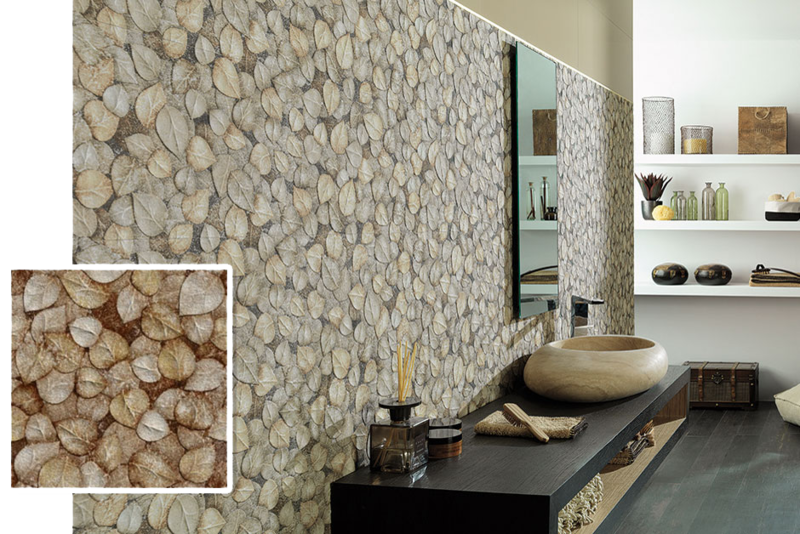 If you’re looking for a bolder statement piece, try an accent wall in Porcelanosa’s ceramic Oxo Garden Arena. The variation of color within the leaf pattern provides an interesting contrast of color allowing you to mix and match additional finishes around the space easily. 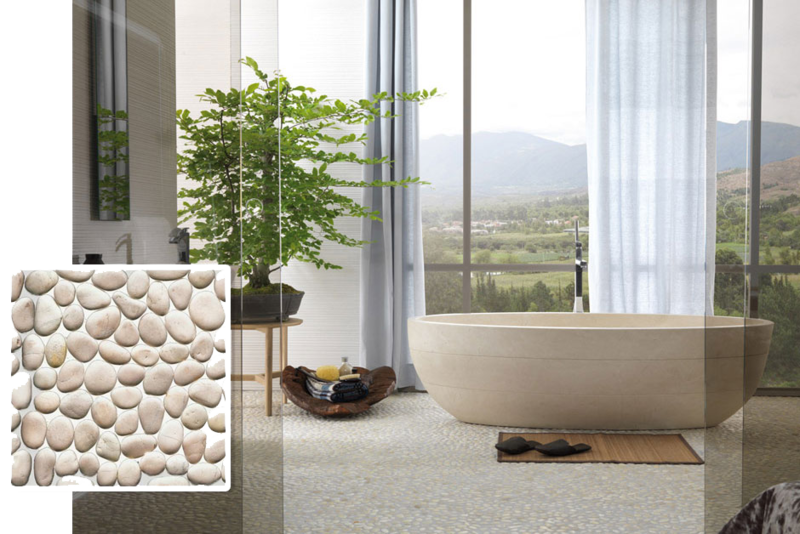 If you are seeking a tropical-like space, install the Paradise natural stone pebbles on the floor of your shower. The soft pebbles gently massage the feet while providing the relaxing ambiance of a tropical outdoor showering experience, reminding you of sun, beach and ocean. 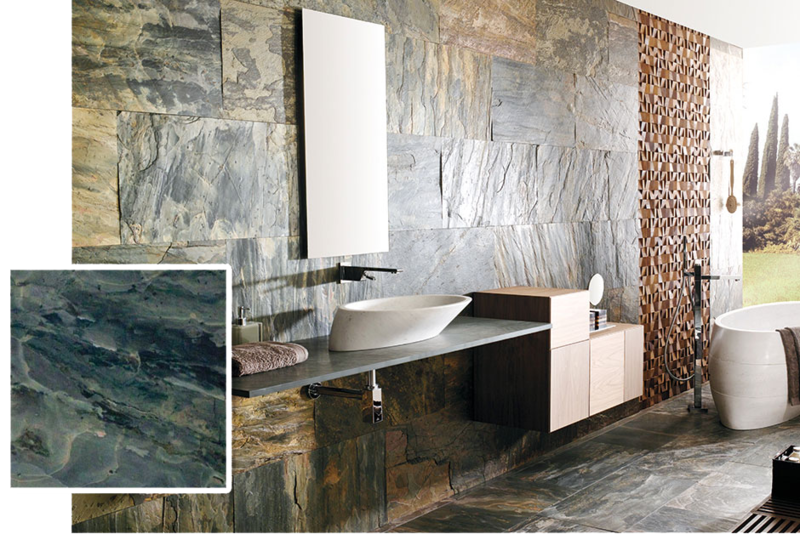 An easy way to incorporate nature into a space is by using natural stone elements such as sinks or bathtubs. The Maya sink mimics a pebble shape and is created out of smooth stone, pairing well with the before mentioned Paradise collection. Porcelanosa offers a variety of natural stone bath products ranging from sinks to shower trays. 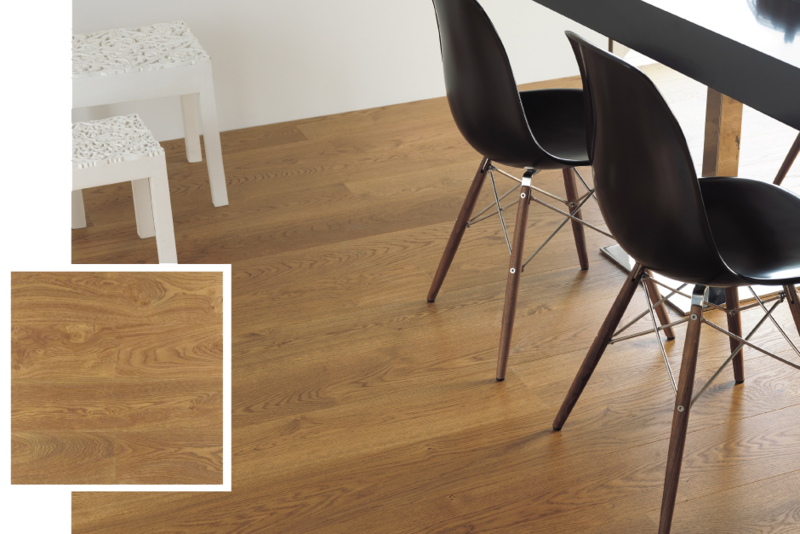 Adding natural wood tones to your kitchen creates charm and brings the outdoors into your space. A common way to do this while still maintaining a modern vibe is to pair a glossy solid cabinet color with a wooden countertop showing a myriad of its natural grain. 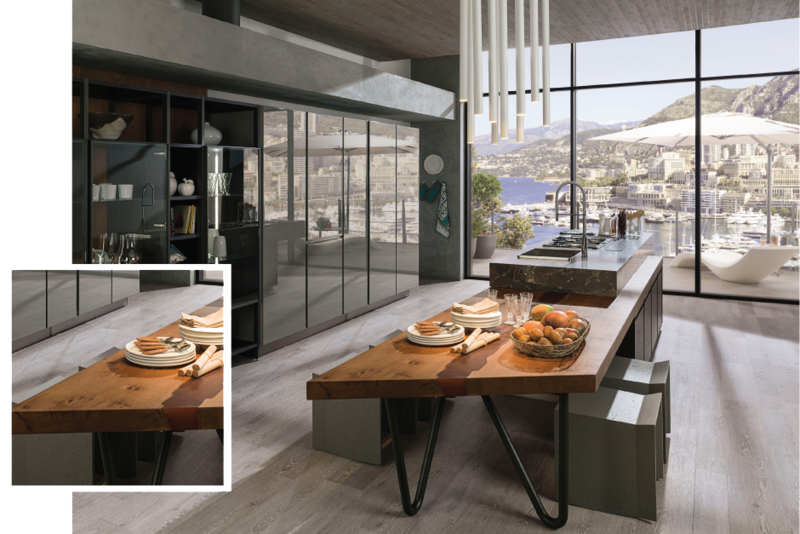 One of Porcelanosa’s newest kitchens marries the two together seamlessly for a beautiful result in the E5.30 – Roble Noche/Roble Sil kitchen. Porcelanosa has taken this design trend to the next level and has incorporated it into large projects. The Raddison Blue Hotel created a wall out of Porcelanosa’s solid surface material Krion® mimicking a rock wall. The look is nature inspired yet, still maintains a modern and unique design. Furthermore, look what innovative designs come from nature inspiration with Veronica Martinez’s sculptural furniture line made of Krion® solid surface material. Are you as inspired as we are?